The empty church was filled with resonating “ahhhs” coming from a group of young children at St. Paul’s, Houston, as they warmed up their voices to sing. 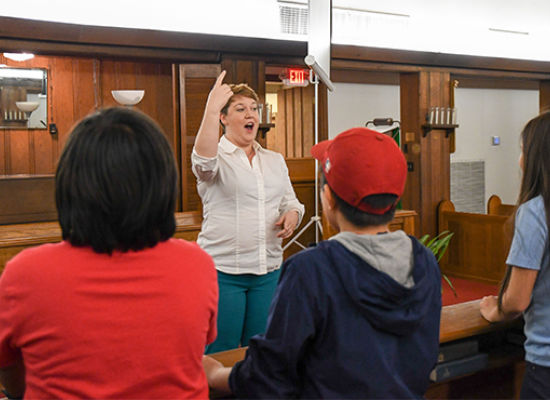 “Open your mouth wide and really emphasize the ‘ahhhhh,’ pretend you want [the audience] to be able to read your lips,” explained Kari Zimmerman, director of the Children’s Choir. The children’s choir is fairly new. In August 2016, the Rev. Ed Gómez started to recruit students from nearby Park Place Elementary School. The church has a deep connection with the school as their first meeting place in 1923. “I wanted kids from low-income families to have access to arts programs because I have heard and read about how music education helps improve academic achievement,” Gómez said. He learned the school was no longer offering art programs to its students. 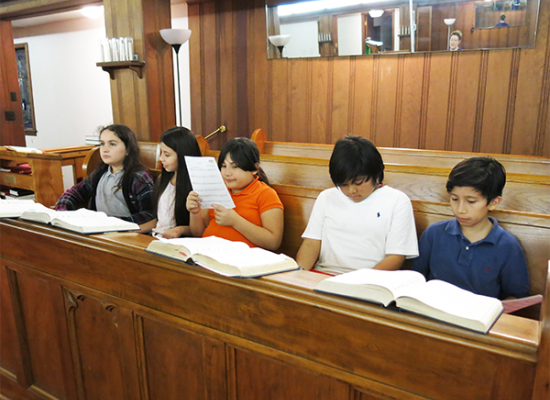 “I felt it was the Holy Spirit who brought us together and that’s when we decided to start a kid’s choir,” Gómez said. 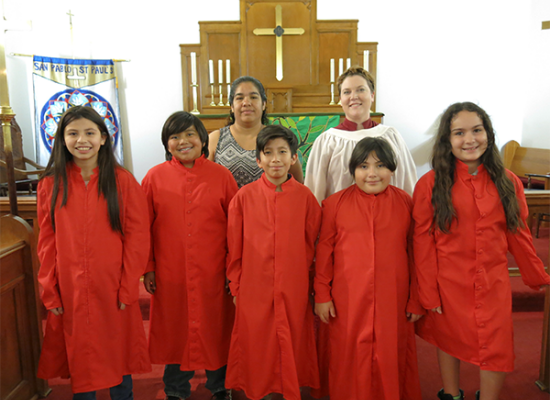 Gómez received a community engagement grant from the Episcopal Health Foundation and raised an additional $1,000 to start the choir. 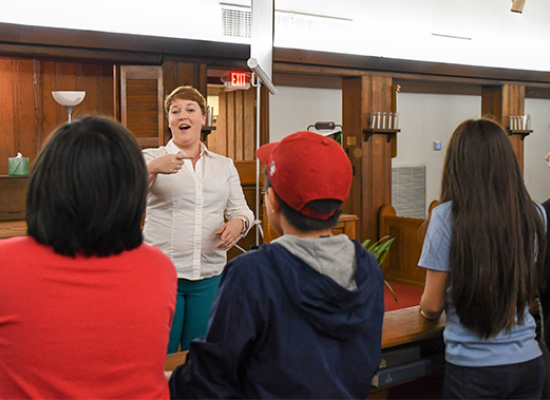 Zimmerman, a soprano singer, has been singing at St. Paul’s since October 2012 and she is also a Pre-K choir teacher in the Aldine School District. 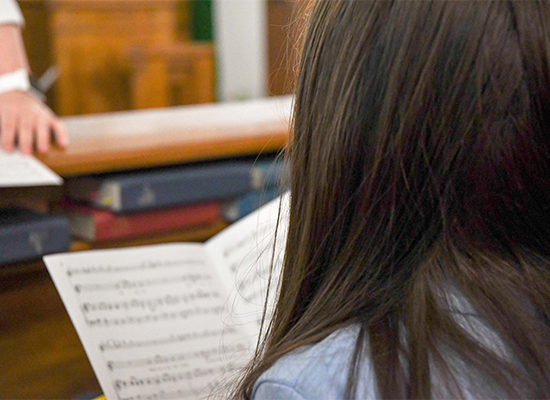 She sometimes incorporates Christian history into the music lessons when introducing a new song. 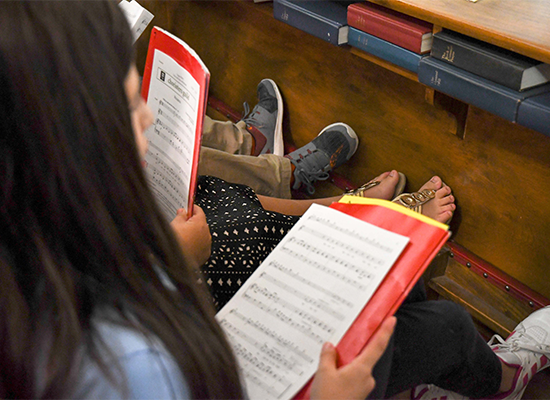 Cynthia Daniela Rios, who attends the KIPP Intrepid Preparatory School, loves to come to choir practice. She wants to be a singer and said she has sung duets and solos at her school. 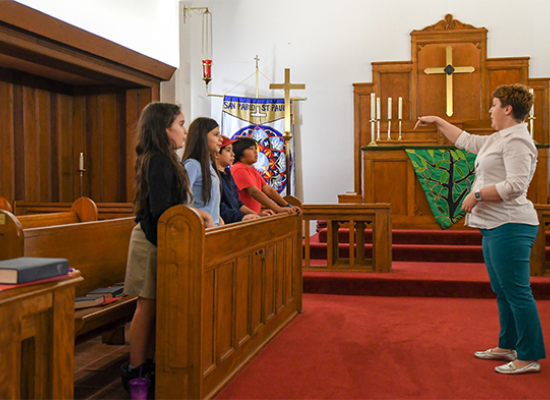 Eva Osorio teaches fitness and nutrition at St. Paul’s and brings her 10-year-old daughter, Jatzyry, a student at Lewis Elementary, to choir practice every Wednesday. Osorio said she has noticed significant improvements in her daughter’s schoolwork and behavior. “Music is the only subject that uses all of the seven intelligences—kids get to interact with other kids, do math, read, sing—it helps develop parts of the left side of the brain that process language,” Zimmerman said. 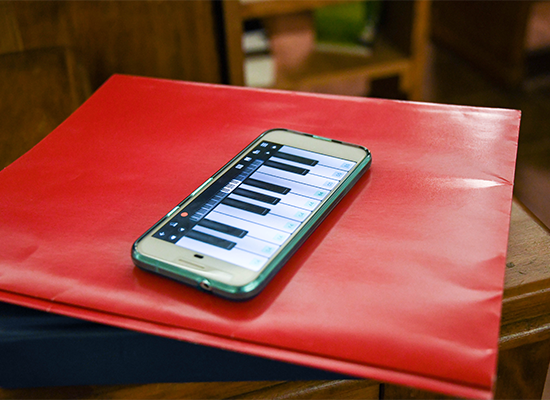 José Nelson Sandoval brings his 9-year-old daughter, Luz, to choir practice so she can improve how she communicates and interacts with other kids her age. Luz was born and grew up in El Salvador, spent some time in Mexico and now is trying to learn English and get caught up in school, Sandoval explained. “This is her first year here in the United States, so she faces a lot more obstacles than the other kids her age,” Sandoval said. 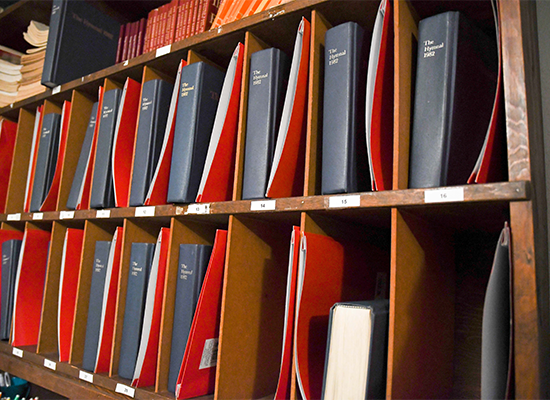 Although the choir is relatively new, Gómez and Zimmerman have a lot of plans to expand and offer more resources to the students. Zimmerman recently applied for a grant to get a keyboard. 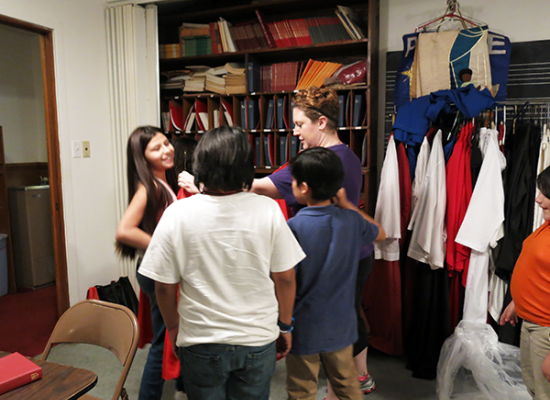 The choir is also working on getting recorders and robes for their upcoming concerts on Palm Sunday and Mother’s Day. 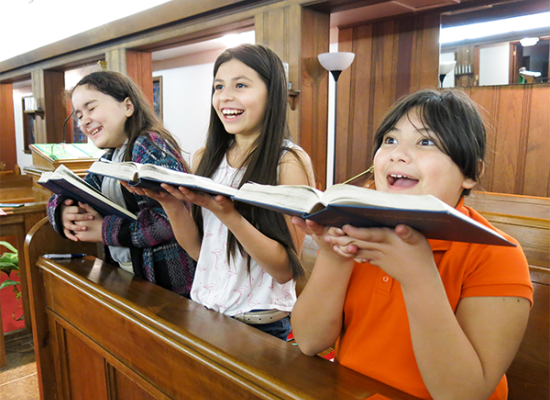 “We want to offer kids catechism, pre-evangelization to the best of our traditions, improve their educational outcomes as well as their studies,” Gómez said. 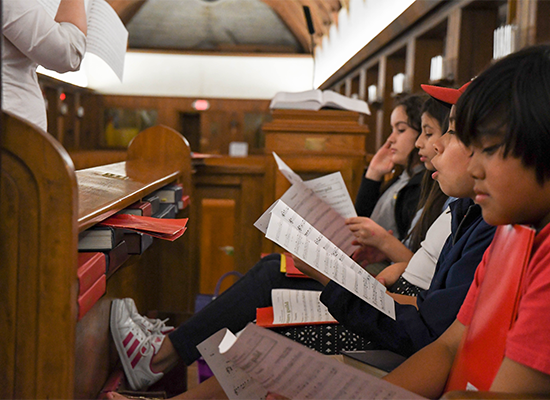 The choir also serves to familiarize new families with St. Paul’s/San Pablo and brings the community together in the important work of providing healthy resources for their children.